IHC Global Expands its Capacity through Merger! During the Second Annual IHC Global Open Forum, held on May 16, 2017, IHC Global and IRPF announced the approval by both Boards to merge the two organizations, in order to combine their efforts to create and affect equitable change in global urban development. The policy and advocacy concerns and skills of IHC Global will be augmented by institutional development and real property expertise, importantly including private property rights and tenure security, of IRPF. The new organization will take the name of IHC Global. Staffs will be merged and current IHC Global CEO Judith Hermanson has been appointed as the CEO of the merged organization. The Forum, which took place in conjunction with the NAR Legislative Meetings in Washington DC, featured IHC Global President and CEO Judith Hermanson, International Real Property Foundation President and CEO Norm Flynn, IRPF Managing Director Sylvia Luchini, and NAR Representative and IHC Global Board member David Wluka, each of whom discussed the important role the private sector will play in the implementation of the New Urban Agenda. Learn more about our expanded capacity here. A new study by the Inter-American Development Bank estimates that rising sea levels will threaten 4.2 million people who live in low-elevation coastal zones of Small Island Developing States (SIDS) in the Caribbean and in the Pacific. The study, co-authored by Michael Donovan of the IDB and Michelle Mycoo of the University of the West Indies, evaluates lessons learned from coastal planning programs in the Caribbean and Pacific and lays out a path forward for implementing a preemptive 'Blue Urban Agenda' to forestall the economic consequences of flooding and coastal erosion on coastal cities. While SIDS may have the most to lose from a changing climate and rising seas, they are also leading the way in efforts to implement adaptation strategies and build resiliency. As co-author Donovan says, "Mayors in port cities across the globe could benefit from the policies that Small Island Developing States are developing as their governments respond to coastal transformation." Brainstorming and creating innovative urban policy is an important first step that urban experts and policymakers need to take towards a sustainable urban future, but the real challenge is finding a way to turn those policies into actions. Implementing new urban policies will be a difficult process worldwide, but a new think tank aims to change that. The Coalition for Urban Transitions, a think tank jointly managed by the World Resources Institute and the C40 Cities Climate Leadership Group, will draw on academic, NGO and private sector expertise to provide evidence-based guidance on how urban growth can benefit both people and the planet. This think tank, which is a subset of a similar, research-based effort called New Climate Economy- will specifically target national-level decision-makers whose policies will affect cities. In an exclusive interview, Citiscope correspondent Greg Scruggs talks to New Climate Economy head of policy and urban development Nick Godfrey about the think tank's plans. The United Nations Economic Commission for Africa has released a new report in which it urges that Africa's mission to urbanize should be tied to industrialization. As the fastest urbanizing region in the world after Asia, African countries' economic prospects depend on whether or not their rapid urbanization- which will make the continent predominantly urban in less than 20 years- is managed well. In the report, the UNECA urges African countries to reestablish the link between urban and industrial growth by leveraging the force of urbanization to drive and enable industrial development, and to create strong, well-functioning industrial systems in cities in order to accelerate and extend industrialization. IHC Global recognizes Africa's need for economic growth to accompany urban growth, but stresses that for true longevity, the systems and institutions must include sustainability and inclusive growth as key components of their strategies. The Swedish Embassy and the UN Refugee Agency are hosting a seminar to discuss the devastating humanitarian crises that the world faces today- and the crucial role that the private sector plays alongside governments and NGOs to foster innovations to meet humanitarian needs. The seminar will include leading representatives from Swedish and U.S. government agencies and private companies to discuss the roles, opportunities and responsibilities of both the humanitarian groups and their potential partners. Since the U.S. presidential election in November 2016, international development experts have had their eye on whether or not the new administration will uphold the U.S.'s commitment to the Paris Climate Agreement, signed by 200 countries in 2015. The administration has yet to arrive at a conclusive answer on the matter, and while the President's decision could affect federal implementation of climate-friendly policies, it may not make a difference in cities. Many American city officials have already expressed their enthusiasm for the Paris Agreement, but Los Angeles mayor Eric Garcetti is the first to put it in certain terms. In a tweet on Tuesday, Garcetti said, "If the White House withdraws from the Paris Climate Accord, we're going to adopt it in Los Angeles." Cities have proven to be crucial to the process of achieving global sustainability initiatives, from the Paris Climate Agreement to the New Urban Agenda. As areas dense with exploding populations and large carbon footprints, cities benefit from policies that aim to reduce pollution and protect the environment. If the situation demands it, local urban governments may make the choice to chart their own courses. Cities don't sign international treaties, and Garcetti's pledge to maintain the treaty was political, not legislative. But there is power in numbers, and more than ever, cities are coming together to unite behind common goals. For example, the Mayors National Climate Action Agenda commits U.S. mayors to working together to strengthen local efforts for reducing greenhouse gas emissions. The C40 Cities Climate Leadership Group is a network of the world's megacities committed to addressing climate change. It's groundbreaking that cities are coming together to rally for their causes, but the more important aspect is that national governments are actually listening. This interesting shift of power represents the high status that cities currently have on the world stage, and the power they have to influence environmental, political and economic issues. As the world becomes increasingly urban, local governments taking the lead on global initiatives may be the key to achieving global sustainability. Discover how Putin's Moscow is taking on urban greenery here. The Philippines is no longer accepting development assistance. Learn more here. Why are some cities so much more productive than others? Find out here. China's $290 billion investment in land aims to make better cities. Read more here. 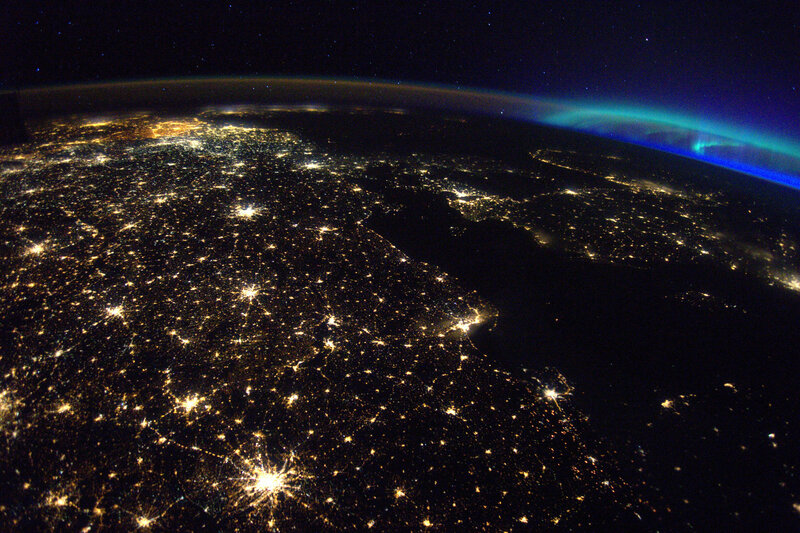 This photo, taken from space by astronaut Thomas Pasquet, shows European cities at night, with the aurora borealis to the north. Warsaw is at the bottom, and the always-lit Belgium is at the top left.